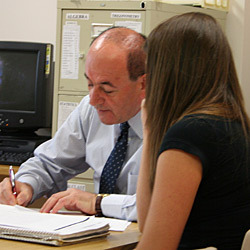 The Mathematics and Computer Science (MCS) laboratory is a division of Barry University's Learning Center that offers free tutoring and academic support to all students enrolled at Barry University. The MCS lab promotes a learning-to-learn approach by empowering students with the necessary strategies for life-long learning and growth, along with the skills required to succeed in their mathematics and computer science courses. A full range of one-on-one and technology-supported tutorial programs are offered by professional tutors, many of whom are college professors. Moreover, students at every level benefit from the broad span of subject areas that range from developmental mathematics through advanced calculus, statistics, physics, computer applications, and programming languages. What's more, to further meet the students' needs, there is always an open door policy, with flexible operating hours to accommodate the busy schedule of both on-campus and commuter students. Review for Standardized Tests: Graduate Record Examination (GRE), Graduate Management Admissions Test (GMAT), College-Level Academic Skills Test (CLAST), Florida General Knowledge Test (GKT).